"For a stronger business community in an international arena"
The EFBQ is an independent institute for Business Qualification, founded in 1992 under the auspices of the European Commission. The EFBQ promotes, tests, and qualifies strategic entrepreneurship in order to contribute to stronger businesses. By means of the EC-Standard®, a unique methodology that assesses the management on all relevant aspects, the EFBQ Peer Group has become the benchmark for strategic entrepreneurship. Approximately 100 ambitious enterprises that are active in virtually all sectors of the business community have themselves tested according to this measuring standard. 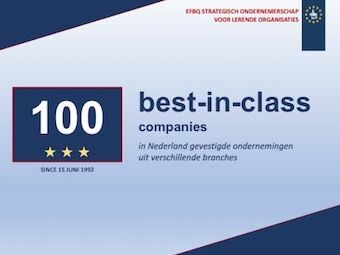 Through its network of exceptional exemplary companies from many different branches, the EFBQ offers selected companies the opportunity to keep improving themselves. An EFBQ assessment does not merely look at the things your company does right; it emphasizes whether you do the right things. The EFBQ provides managers and entrepreneurs a chance for self-examination and answers the following question: how are you performing as a business and how does this compare to other participating companies? What are your strong points and what areas offer room for improvement? Participating companies may also expressly distinguish themselves from other companies with the EFBQ qualification. More importantly, participants learn from each other and take major steps with regard to profitability, continuity, and the creation of value. In this way, the EFBQ commits itself to realizing visibly improved companies. The EFBQ promotes, tests, and qualifies strategic entrepreneurship in a network of enterprises that wish to learn from each other. This mission is pursued in various ways.